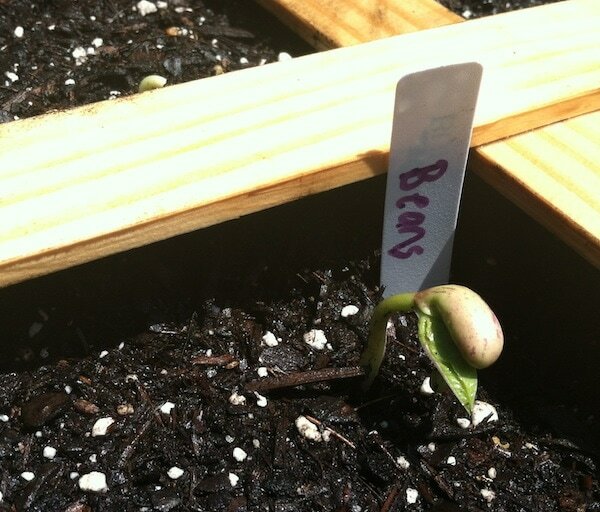 Lady and the Blog → Living → Square Foot Gardening: Is That… A Bean? Square Foot Gardening: Is That… A Bean? I visit my Square Foot Garden about twice a day just to make sure that a)things are going as planned and b) to water the plants. It is SUPER hot these days and my backyard vegetable garden gets about 8-9 hours of direct sunlight during the summer. Some of my tomato plant leaves dried out which led me to believe that my garden was thirsty!! It’s fun. Believe me. I’m not complaining. When I went out yesterday, I spotted a new sprout. We already saw my cucumbers… and today we have BEANS. AHHHH – oh the possibilities. Is it strange that I’m thinking of my sprouts as children. I feel so connected to the whole thing – like I am nursing these little beings into adulthood. Yes, I’m dramatic.